A cyst is a sac like small body or vesicle which may present inside or above the conjunctiva layer containing fluid or blood in it known as conjunctival cyst. These conjunctival cyst have the tendency to resolve by its own that is why Conjunctival cyst do not require any treatment. But sometimes, if the condition get worse then the treatment is done with anti-inflammatory drugs otherwise a surgical operation is recommended. Conjunctival cyst are considered harmless and may white and red in color depending upon the fluid or blood filled in it respectively. These cyst cause irritation in the eye and the patient do not feel comfortable. These cyst cannot be seen with naked eye so specific tests are performed to diagnose the condition. The conjunctival cyst are painless but the patient may feel problem in eye blinking. These cyst appears like a small watery blister and excessive rubbing makes it worse and make it very difficult to get rid of it. The conjunctival cyst are formed suddenly on the surface of conjunctiva or inside conjunctiva. The conjunctival cyst may be congenital or develop after birth in adolescence or adulthood. Most of the time these cyst are due to eye allergies. The appearance of a small blister shaped bulb on the surface or under the conjunctival layer. Patient feels severe itching and rubbing makes it worse. Patient feels problem in blinking eye if cyst gets bigger in size. Due to excessive rubbing, the eyes become watery. The eyes also become dry due to less blinking of eye and more contact with air. The cyst formed is transparent or white in color. The cyst may resolve on its own in few days. These conjunctival cyst are caused due to an allergic reaction to eye. Any eye infection can also lead to formation of conjunctival cyst. The infection may be due to any virus, bacteria and dust particle enter into the eye. 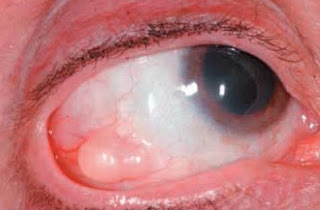 Due to these two reasons, the patient rub his eye and this excessive rubbing may lead to formation of conjunctival cyst. The cyst may grow up in bigger size due to rupturing of conjunctival layer. Other causes behind conjunctival cyst are the accumulation of tears in eye, may be congenital and environmental factors also contribute towards its occurrence. 1st the physician wait until the cyst disappear on its own with the help of artificial tears. But if the cyst remains, then some topical steroids are used as drops to treat conjunctival cyst. And if still the cyst persist, then surgical removal is recommended. Surgery diminishes the symptoms associated with cyst. Surgery performed is painless and is performed under local anesthesia. The cyst is removed via small incision and all the fluid is squeezed out of it. Main benefits of surgery are recovery is fast, less infection risk and minimal scaring.